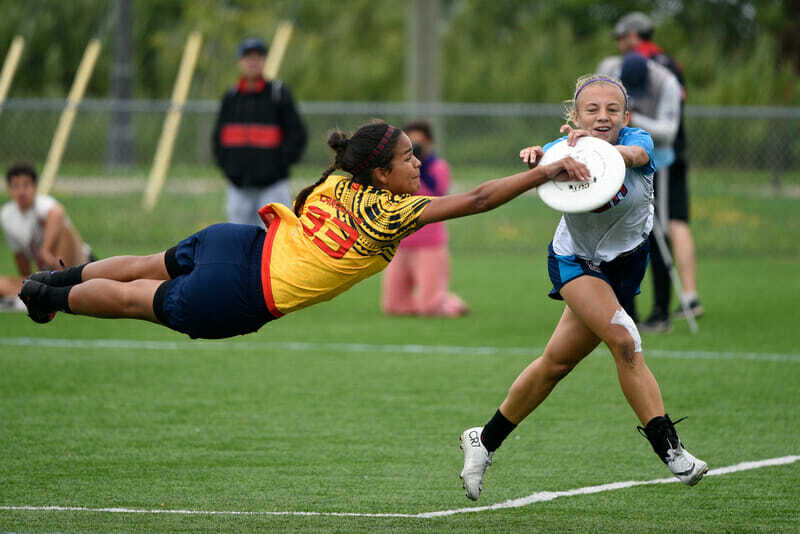 The two pre-tournament favorites clashed in the gold medal game of the Under-20 Girls’ Division of the World Junior Ultimate Championships. The division’s biggest stars had a chance to go toe to toe: the Cárdenas twins of Colombia and Claire Trop of USA. The wind provided much of the context, as did the emphatic defeat the US National Team had handed the Colombians earlier in the tournament. The U.S. team’s superior depth and efficiency allowed them to take control of the game as it neared halftime, and pull away in the second half for a comfortable 15-8 victory. The beginning of the game was inauspicious, as both teams struggled to find any rhythm in the buffeting winds. Colombia’s first throw went to the ground while the USA began with roughly as many turnovers as completions on the first point. The Colombians scored in the red zone after a short field turnover from the United States. But, perhaps fighting off some early jitters, the teams settled in, trading downwind scores from most of the half. The U.S. O-line was efficient with their opportunities, with just a single turnover in the first half. Colombia tried both zone and matchup looks but generated little friction. The defense failed to generate pressure against the experienced and skilled offensive unit, led by the play of Trop and Stacy Gaskill, the latter of whom corralled three of the team’s first four scores. Gaskill led the United States during the tournament with 21 goals. Meanwhile, the Colombian side was keeping pace, but with a very different style of play. They were more aggressive deep, and when forced to work their typical small ball dish-heavy offense, struggled to execute. While Gabriela Gomez and the Cárdenas twins anchored the offense, they were challenged by defenders and forced to grind out multi-possession scores. This wore on their legs, which had already been taxed more than their oppositions’, contributing to the USA surge in the second half. Perhaps the combination of fatigue and the USA defense was what kept Colombia from connecting on so many close calls. One of those was an around break from Manuela to Valeria Cárdenas, a common connection for the pair, that was just a touch wide, despite Valeria’s athletic diving effort. The U.S. capitalized, heaving a jump ball that lured a pack of players underneath it. Tess Johnson went over the top of the mass to bring in the catch for the US, and a few throws later, Trop sent an around backhand into the end zone. The low throw was claimed by a bidding Dawn Culton for a U.S. upwind break to make it 7-6. Colombia’s opportunity to get the game back on balance came on the next point, when they could flip the upwind break. Abby Hecko had other ideas, blocking a reset throw to set up a Trop huck. While that throw was sent too long, it gave the USA strong field position. A short field turn from Colombia was quickly converted into a two goal lead for the U.S. as they took half. Once this advantage was in the hands of the United States, they tightened their grip as the Colombians struggled to keep up. The US slowed down Colombian offensive points with tight matchup defense, zones, and help defense on the hucks. They threw various defenders at Colombia’s top three; Trop and Ella Jeungst were particularly effective. Even the playmaking the Colombians are known for was not enough. A spectacular second effort layout goal by Manuela cut the USA lead to 9-6, and Colombia was nearly able to get an upwind break on the ensuing point. Trailing 10-7, a layout block by Laura Arango helped protect Colombia’s opportunity to hold, but the U.S. broke on a contested layout grab by Juengst. The U.S. got two blocks on the next point, which concluded with Trop zinging a forehand to the front cone for Juengst, who collected the disc past a flying Manuela. That play exemplified the game. Juengst, one of the brightest USA stars, receiving a disc from Trop just past the scintillating and intense effort of a Colombian superstar, set up by a pair of blocks by different U.S. defenders. Colombia could not match the USA’s depth of contributors and their explosiveness was nearly equaled by their opponents, while the USA’s skill and composure simply outpaced Colombia’s. The United States closed out the match with a 7-2 run. The gold medal-winning score was bookends for Culton, who caught an uncontested break side throw sent over the stack by Hecko as the stall count rose. Rushing the field to celebrate, Team USA completed an impressive performance, overpowering their talented opponents. They asserted their superiority, proving they were without question the deepest and most skilled squad, definitively the top team. They have the hardware to prove it. Comments on "WJUC 2018: USA’s Depth Overpowers Colombia’s Stars In Girls’ Final"